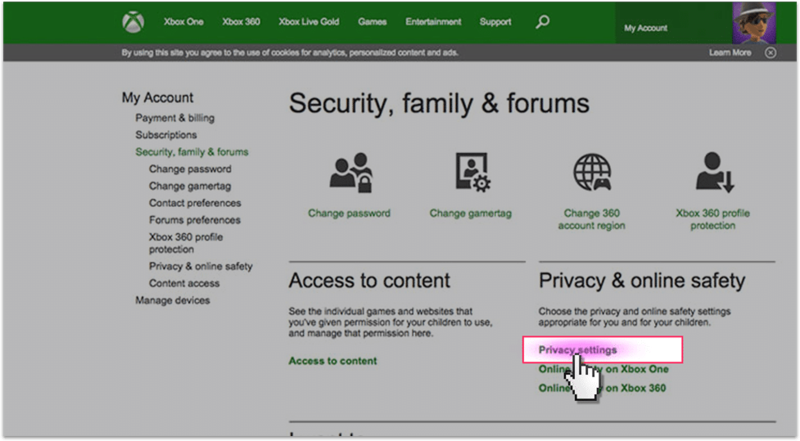 The Xbox Live privacy settings allow you to choose who your child can interact with online with their Xbox. They are pretty limited but you can set up more parental controls through the Xbox settings on the device itself. Open your Xbox account through a web browser and sign into Xbox Live using your email address and password. If not already selected, choose Account in the top left-hand corner of the screen, then click on Security, family & forums. Then click on Privacy settings. In privacy select Block to prevent other people from seeing your child’s profile (which can contain personal information) and your child from seeing others profiles as well.